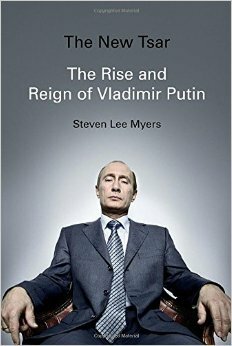 Gary Anderson at the Washington Times offers a review of Steven Lee Meyers' The Rise and Reign of Vladimir Putin. Some traditional American allies are beginning to view the United States as a nation of lions led by a sheep, and Russia as a nation of sheep led by a lion. For several years now, Russian President Vladimir Putin has consistently outthought and outmaneuvered a seemingly hapless President Obama on the world stage. Perceptions are everything, and Mr. Obama’s foreign policy is in tatters; it is too late to salvage that. The next American president will have to show our allies that our country still has resolve and can be trusted. To do that, our next commander-in-chief must be able to deal firmly with Mr. Putin. If knowing your adversary is key to dealing with him, our next president should read “The New Tsar,” Steven Lee Myers’ biography of Mr. Putin. Mr. Myers traces Mr. Putin’s rise from the only surviving child of a poor Russian war hero workingman in Leningrad (now St. Petersburg) of the defunct Soviet Union to the leadership of a newly assertive Russia. The author does so in a no-nonsense narrative that largely avoids hyperbole while explaining the development of the psyche of a world leader.